Tsjetjeense autoriteiten martelen iedereen die zij als LHBT verdenken. Chechen authorities are continuing to arrest and torture anyone they “suspect” is LGBT+. We’ve been here before. In 2017, over 100 men were thrown into an illegal prison, beaten and tortured until they “outed” others. At least three men were murdered. This time, we know that at least 40 people have been rounded up in the last few weeks, including women. We also know that Chechen authorities have already murdered two people just because they’re perceived as LGBT+. My organisation – the Russian LGBT Network – is partnering with All Out to run an emergency evacuation that will save lives. 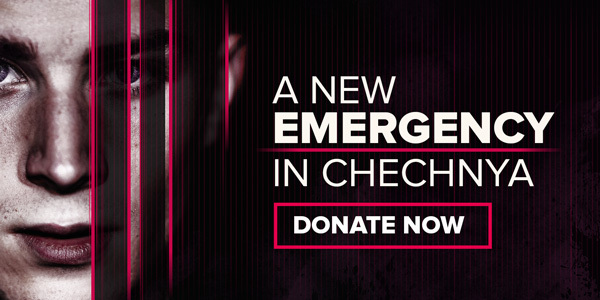 We urgently need your help to fund these efforts, so we can get each and every LGBT+ person in danger out of Chechnya and to safety before it’s too late. As an openly gay man living and working in St. Petersburg, I know what it’s like to be treated like you shouldn’t exist. But I can’t imagine the terror and fear LGBT+ people in Chechnya must be experiencing right now. My colleagues and I are determined to work day and night to evacuate those that are in danger, but we need your help. All Out members were crucial in helping us relocate 130 Chechens in danger during the last “anti-gay purge.” We still don’t know exactly how many people will need to be evacuated this time around, but it could be just as many, if not more. Your support today could be their only chance of survival. Please donate today to help those in danger escape this state-sponsored horror. In solidarity, , Igor Kochetkov – Russia LGBT Network (ook: Bron).